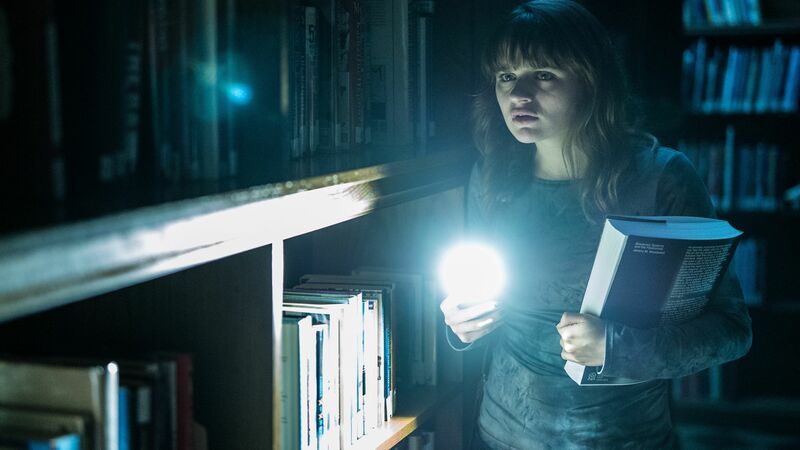 "Slender Man" does for YouTube what "The Ring" did for VHS, but really, really, really badly. A tasteless and inedibly undercooked serving of the internet’s stalest Creepypasta, “Slender Man” aspires to be for the YouTube era what “The Ring” was to the last gasps of the VHS generation. But while both films attempt to mine full-fleshed horror mythologies from spooky viral videos, luring their hapless characters into an unwinnable war of attrition with an evil force that lurks on the fringes of the visible world, there’s one fundamental difference that sets the two movies apart: “The Ring” is good, and “Slender Man” is terrible. And while the awfulness of a mid-August studio movie can easily be taken for granted, “Slender Man” isn’t just bad, it’s also disappointing. As problematic as it was always going to be, the idea of a horror film based on the world’s most pervasive digital folklore was full of raw potential. The character of Slender Man has been inflaming the public imagination ever since a guy named Eric Knudsen introduced him on a web forum back in 2009. A gangly, faceless shadow creature in a business suit, Slender Man immediately became an open-source phenomenon (though Knudsen still owns the rights). In addition to inspiring a popular YouTube series, a video game, and a bottomless trove of other assorted fan fiction, Slender Man was also tragically invoked in the attempted murder of a 12-year-old Wisconsin girl, which only helped perpetuate his legend. After that, the monster was blamed for suicides, and scapegoated for the kind of aberrant teenage behavior that parents used to pin on the likes of Marilyn Manson and “Mortal Kombat.” In a time before the Trump crisis diverted the internet’s attention to pee tapes and QAnon, Slender Man became the internet’s favorite boogeyman, something that anyone could add to but no one could control. Only the most insidious details about him were accepted as canon: Slender Man abducts children, he targets those who investigate him online (eek), and he’s standing behind you right now. And yet, despite having all of that history at their disposal, Sylvain White and David Birke made a Slender Man movie that reduces him to a generic monster of the week, sanding away virtually all of the mystery and disquiet that makes the character so gripping. I’m not sure what I expected from pairing the director of “Stomp the Yard” with the screenwriter of “Elle,” but it certainly wasn’t just an unmotivated collection of deafening jump-scares that have been welded together with all the artistry of assembling a table from Ikea. The story, such as it is, takes place in a town so anonymous that it’s never even given a name. This isn’t just one of those nondescript horror burgs that’s left blank so that viewers can imagine themselves living there, it’s literally just a high school and a forest that are connected by some perilously under-lit streets. The people who live there are just as basic. Hallie is our final girl, and the only notable thing about her is that she’s played by “Bunheads” star Julia Goldani Telles, a major talent whose semisweet prickliness is wasted here. Piper (Annalise Basso) is the edgelord best friend whose morbid fascination with the occult reflects an urgent desire to grow up and get out of town; Piper has the closest thing to an actual character, so of course she disappears from the movie after 10 minutes. The clique is rounded out by Wren (Joey King) and Chloe (Jaz Sinclair), two teens who don’t have a single identifiable trait between them. The film’s occasional attempts to flesh out its victims, or establish even a hint of personal history between them, only calls attention to how woefully underwritten they are. It really doesn’t matter why the girls decide to watch this super creepy web video they’ve heard about, but it goes without saying that they live just long enough to regret it. They watch the thing, and bad stuff happens. Piper disappears into the woods, and the other three girls start to freak out. They’re haunted by horrors that no one else can sense, as though they can hear the ominous fart noises that constantly thunder over the soundtrack (a sorry excuse for a scary atmosphere). What if Slender Man… is real!? This is when the film shirks convention and leans into the singular elements of its premise, sending the girls into the darkest corners of the internet as they investigate how an ancient evil like Slender Man is empowered by an interconnected culture where fear spreads like wildfire; in a Kaufman-esque twist, Hallie’s gang eventually tracks down Eric Knudsen himself, who admits to having survived an encounter with the shadow monster as a child, and trying to profit off his own trauma as an adult. Just kidding! None of that happens. Each of the girls just goes insane across an interminable parade of scares, the vast majority of which you’ve seen before in a 1,000 better slasher movies. Slender Man sometimes uses digital tools against his victims (e.g. eerie instant messages and Skype calls that are coming from inside the house), but mostly he just does some arbitrary horror stuff. Hands reach out of nowhere, a boy’s face turns into a demon, Hallie dreams that she’s pregnant with a tentacled little Slender Baby, etc. At one point, Wren screams that he “He gets in your head like a computer virus!” Really, Wren? Does the viral internet sensation spread like a computer virus? That’s like Quint telling the unsuspecting people of Amity that great whites eat your legs like a shark. The film’s mythology seems to be made up on the fly, with the only consistent element being that Slender Man loves jump-scares (immortal shadow monsters have to amuse themselves somehow). Even though the dude’s whole shtick is about paralyzing his victims with fear, he tends not to savor the flavor — it often seems like he grows impatient during the movie’s clunky setpieces, ending them with a jolt whenever he gets bored. Maybe he’s feeling a bit burnt out from all the centuries of child-abduction, or overexposed now that he’s grown from something awful to Something Awful? It’s hard to say (the guy has a great poker face), but it definitely feels like his heart isn’t in it anymore. Or maybe Slender Man just has the good sense to recognize that the film’s hyper-conventional approach is doing him a grave disservice. In treating its namesake like any other monster, “Slender Man” loses sight of why the character is so unnerving in the first place — it gives you plenty of reasons to put your hands over your eyes, but almost no incentive to peek through your fingers. As is evident in the spine-tingling found footage YouTube videos that allowed him to become a thoroughly modern riff on a Lovecraftian monster, Slender Man is scary because of what you don’t see him do. He’s a trigger, a writing prompt, a walking nightmare whose long arms are all the better to push you down a rabbit-hole that’s dark enough to bring all of your demons to light. This movie puts him front and center, and fails spectacularly as a result. By showing too much, “Slender Man” offers nothing to see. “Slender Man” opens in theaters on Friday, August 10.